Exercise for seniors? No problem. Lee strode across the exercise room to the next weight machine. She leaned over and set the stack of weights to the thickness of several New York City phone books. She sat down and slowly curled her body forward, lifting the weights with the strength of her stomach muscles. After repeating this a dozen times she smiled, patted her belly, and said “I’m trying to work on this area a bit.” Then she made her way to the next machine. Lee Warren Shipman of Maryland is 80 years old, and has three grandchildren. She’s had a complete knee replacement and lives “up 22 steps” in a house she designed herself. She has been lifting weights twice a week for over five years. “I think this prevents osteoporosis” she says. Lee knows that strength exercises — defined as any exercise that builds and strengthens muscles — improve bone density and combat the effects of osteoporosis. Strength exercises are also referred to as strength training, resistance training, weight training, and weight-lifting. But whatever you call them, research funded by NIH’s National Institutes of Aging (NIA) shows that older people, even those in their nineties, benefit greatly from them. 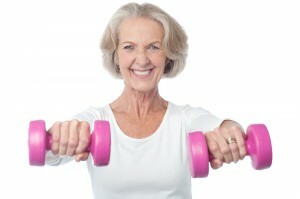 The list of health benefits from strength exercise reads like a visit to the fountain of youth. More muscle burns more calories and thus can help with weight control. The increased muscle mass can also help control blood sugar. Strength exercises can improve mood and relieve depression. They can help increase balance, and make getting around a whole lot easier, therefore potentially preventing injury. Around since the times of ancient Greece, strength exercises are now proving popular among older adults who have learned it’s never too late to start. Research shows that muscle strength declines by 15 percent per decade after age 50, and 30 percent per decade after age 70. Scientists have found that people lose strength and muscle tissue not because they grow older, but because they stop doing activities that use muscle power. The combination of reduced strength and lower activity levels can lead to an increased incidence of falls and decreased walking ability. Muscle strength training can be done by virtually anyone, according to Dr. William Evans, Director of the Nutrition, Metabolism and Exercise Laboratory at the University of Arkansas for Medical Sciences. In research funded in part by NIA, he has shown that frail nursing home residents as old as 98 years (many with multiple chronic diseases) have remarkable increases in muscle strength and size following only a few months of strength training. The results are exciting for scientists because they reveal that even aging skeletal muscle retains its amazing adaptive ability. But perhaps more importantly, the findings have enormous practical significance. Strength gains can lead to greater walking speed, stair climbing power, and balance. An increase in strength can make the difference between being able to get up from a chair by yourself, or having to wait for someone to help you get up. You don’t need to own spandex clothes, barbells, or a gym membership to do strength exercises. All you need is a positive attitude and a few spare minutes. Exercises can be done at little or no cost in your home. A guidebook and companion video put out by NIA (see Resources below) offer clear step-by-step instructions for exercises. Alternatively, structured programs are often available through local health clubs, universities, hospitals, churches or synagogues, senior or civic centers, or park and recreation associations. Strength exercises are one important component of overall fitness. The other components include aerobic exercise, balance and flexibility, which are also featured in the NIA book and video. Helpful hints that answer how much and how often to do strength exercises are listed in “A Word To The Wise”. Remember to check with your doctor before starting any exercise program. Even small improvements in muscle size that you can’t see can have a big impact on the quality of your life. Lee, the weight lifting grandma, has already figured this out. She proudly proclaims, “I am an optimist!” as she makes her way to the next machine. With strength exercises, you can add life to your years in addition to adding years to your life. « Why do I Eat What I Eat?